I spend my days with convicted murderers. Some are well-dressed in bow ties and collared shirts and jackets, their hair immaculately combed. One wears a bowler hat. I’d love to sit down and talk to them through their prison bars, but they’re all dead. “Hanged by the neck until dead,” as the courts ruled. Folsom Prison executed a total of ninety-three inmates, occurring between 1895 and 1937. Folsom’s 93: The Lives and Crimes of Folsom Prison’s Executed Men is the first book to profile in detail, the lives and crimes of these men, as well as the lives of their victims. I became acquainted with these men when I was a child. Their mug shots sat tucked away in a closet at my Great-Great Aunt’s house for over four decades. Turns out her husband Tom, a self-described “professional gambler,” paid a visit to a Folsom inmate who owed him money. 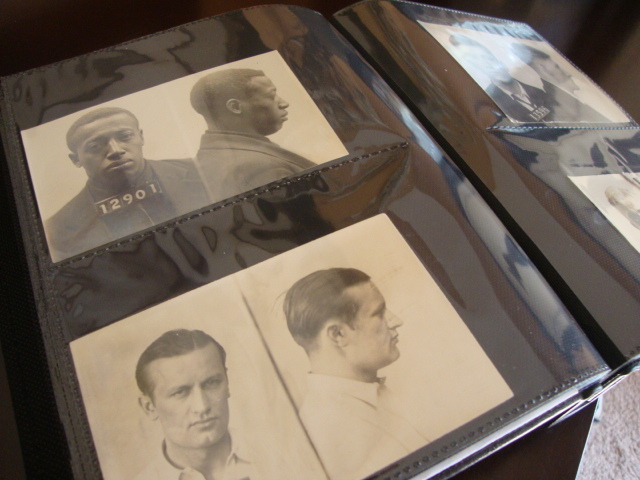 My Aunt figured the warden gave Tom the photographs, but she wasn’t sure. And there was something else. Stashed in the flat box was an original forty-page, typed document—author unknown—chronicling events at Folsom from its early planning stages in the 1850s to 1943. It wasn’t until Tom’s death in the late seventies that the documents resurfaced. Ten years later, my Aunt showed them to the rest of the family. In 2008, I began the task of researching each man, his crimes and his victims. As a writer, I was enthralled. I knew there would be incredible stories to tell, but I had no idea I would uncover so much information. Considering the book covers 42 years, involves hundreds of people, and takes place in a notorious prison, I have accumulated more information than what the book holds. 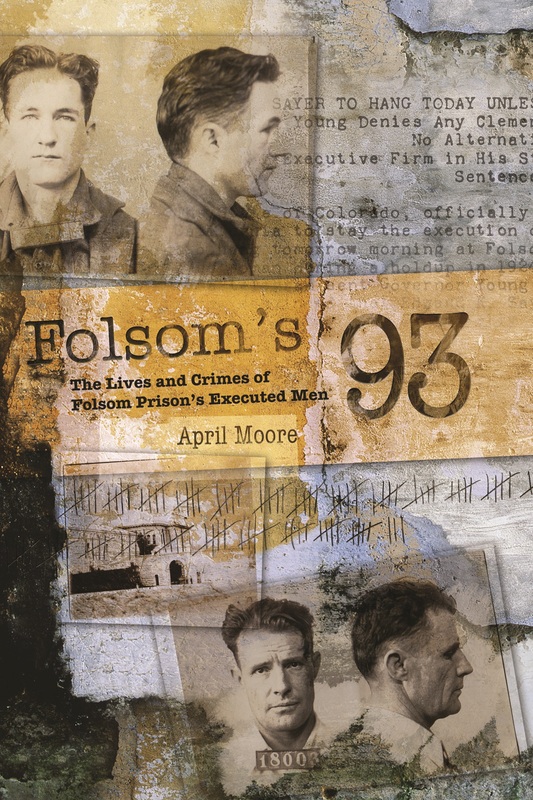 Folsom’s 93 contains many sidebars of information and anecdotes relating to the 93 men and Folsom prison, but it was impossible to include everything. The surplus of these fascinating snippets of history couldn’t go untold, however, and I’ve included many of them on my blog. They deserve to be heard. Want a signed copy? Click HERE. “Truly, one of the finest debut books to be found.” –Dean M.
“Each story is interesting and told in a way only Moore could bring to life with an uncanny precision and style.” –Chuck B. “If you love tales of history, true crime or any other history involving prisons and inmates, look no further….this book was awesome! !” –J’aime R.
“Moore does an excellent job of presenting each person’s back story, details of their crime(s), trial, appeals if any and execution. Recommended.” –Michael O.
very cool, cant wait to read more! Fascinating. Can’t wait to see more! This is a very cool idea for a book, April. Let me know when it is published. Thanks, Dale. My publisher has Spring of 2013 for the release. Hopefully that doesn’t change. Beautiful. Proud to say I know you. Kinda. In a weird typing way. Ha! Thanks. You too, in a weird typing way as well. I’ve been to Folsom prison a couple of times in the 90’s. My brother was incarcerated there for 13 years. This sounds like a fascinating project. Can’t wait to read more! Hey thanks! Folsom’s definitely a fascinating place. I’ve been there once and that was certainly enough for me. Old Folsom or new Folsom? Old Folsom. What about you? My brother was housed at Old Folsom initially, but I don’t think I visited him there. I just remember that the guards were kind of rude every time I went. When I went to interview someone at the Pollunsky unit in Texas, I was taken aback by how polite everyone was. Granted, Texas kills a lot more people than California, but at least the guards (or at least my experience with them) have been pleasant. Interesting. I can’t even imagine the mind set these guards need when working at prisons like Folsom. Not a job I’d want. I worked in a jail for four months and it was horrible. I could only imagine. I’m sure you could write a book on your experiences! Well, now that you mention it, I am writing a book about my “death trip.” It began as my master’s thesis about people who worked with death in their professions. Now it’s more of a memoir of my experience. Prison and death are the two topics that I’m drawn to, so that’s why I’m very interested in your project. I don’t know how people deal with death on a daily basis, so your book sounds like a very intriguing read. I guess now I know more about executions and prisons than I ever thought I would! And I find the prison industry and prison life incredibly fascinating, especially during the turn of the 20th century. Keep me posted on your progress with your book–I’d love to know more about it. Thank you, J’aime–that means a lot. You have a fantastic blog and I’m looking forward to your book, too! Looking forward to book in 2013. A bit of a personal interest. Yes, it sounds like you have a connection to Folsom’s 3rd execution. Such a sad, yet fascinating case. Thanks, Bill. I hope to see the movie, too! Oh, wow. Is Jim your dad? I can only imagine the stories you have about Folsom. The fact that the best cherry pie you ever had was made by an inmate, is a story in of itself. We certainly shared the same fascination with Folsom’s executed men while growing up. My great-great- aunt had those mug shots and we used to love going through them and getting creeped out by their appearances. I always wanted to find out the stories behind the faces, but never imagined I’d be the one to research them and write a book about them! I also think that a few of them were innocent. I’ll be at the prison on July 20th for the initial book launch. I’m looking forward to being at the museum and hearing stories about Folsom. I will try to be there for sure to meet you. My dad was Gil, and he used to do several things. At one point while growing up, he was the one (of several maybe) that took pics of when the inmates rioted or were killed. He had a distaste for Johnny Cash because he basically caused and encouraged rioting when he was there, and he met several of the movie stars during various filming. Of course this was either before I was born, or shortly after, so I don’t know these things personally. I guess if I were to think about it, it was weird being a child…running, skipping, and playing on the grounds ‘right next to’ convicted murderers and rapists, and all sorts of very violent gangs. Of course there was a huge wall and armed guards protecting us. My dad’s life has been threatened, my life has been threatened. You do grow up with a small realization of what people can really be capable of. I would love to get a chance to meet you—I hope you can make it. I think you and the retired guards who run the museum will have a great time swapping stories. That’s funny about Johnny Cash—I can see where your dad (and other guards) wouldn’t be thrilled with him. I’m looking forward to meeting you! I was out of town last Saturday when you visited the Folsom Prison Museum. However, I see that you will be at Time Tested Books tomorrow. I plan on attending and hopefully meeting you. I’m honored that you’ll be there and I’m looking forward to meeting you! @Amy Moore – Are you local to Sacramento/Folsom? I can’t wait to read this book. Also, where’d you do your research? If you don’t mind me asking. Hi, David. Thanks! No, I live in CO, but I spent a lot of time at the archives and state library in Sacramento, as well as the the Folsom Prison museum in order to gather research. Thanks for the information. I love the state library and as a history major, life long resident of Sacramento and grandson of a former Folsom Prison inmate I have to say thank you for preserving a little nugget of our history. are you speaking about ur book soon here in northern colorado? I just hear a blurb on the radio. I will be at Barnes & Noble at Centerra in Loveland this Sat the 4th from noon to 6. You heard a blurb about it on the radio? this book was very cool; a brilliant idea. there should be such a book for every prison where executions were conducted. Hey, thanks…glad you enjoyed it. I agree, there should be a book for every prison’s executions. Wow–the research!